Banff National Park in Canada has a stunningly beautiful landscape. It has snow-capped jagged mountains, impressive glaciers, evergreen forested mountain slopes, serene alpine meadows, surging streams, therapeutic hot springs, emerald-hued lakes, and scenic drives, all set in the Canadian Rockies. Banff National Park also boasts interesting wildlife including grizzly and black bears plus wolves, cougars, coyotes, caribou elks, and bighorn sheep. Most people come from mid-June through August, which causes crowding, especially in Banff town (it's best to come on weekdays). The finest overall time for your vacation trip is mid-May to Mid-June. Next is September. 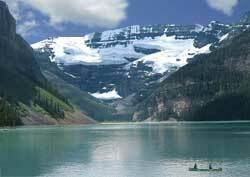 Lake Louise (see photo) and Lake Moraine. These lovely blue-green lakes have mountain backdrops. Tourist pursuits include hiking, climbing, camping, fishing, boating and windshield sightseeing. Banff National Park has several top-flight ski resorts. Other winter sports include cross-country skiing, snowboarding and ice skating.